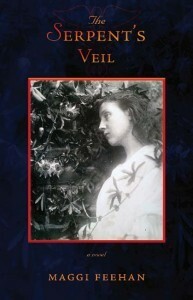 Spanning three continents and the ten years leading up to the close of the nineteenth century, The Serpent’s Veil follows the personal journeys’ of Constance Stubbington and Ank Maguire who grapple with what haunts them: the impact of colonialism, the death of family members, and the intuitive gifts that shape them. Constance, a bold woman who severs her father’s rigid ideas with a sharp tongue, is thrown from a horse and wakes in Guy’s Hospital in London, England. The hospital staff is tight-lipped about her father’s whereabouts and the medical implications of her accident. It is here that she meets Ank Maguire and the two discover that they share a connection with the spiritual world, an intuition that is both a gift and a curse. Through a series of flashbacks, dreams, and up-to-the minute storytelling we travel from the bogs of Ireland, to the streets of Victoria, BC through the Raj lands of India, and to the grimy world of London’s Southwark district. The Serpent’s Veil is a spellbinding tale of action and mystery where people are born and die, mystical revelations dominate, and consciousness is transformed, but above all, spirit lives. Subscribe to Maggi's email newsletter and get inspired.